Hello dear blogging friends: There is a new challenge over at SHOPPING OUR STASH for you to play with, the theme is SILHOUETTES so look around your craft room for these type of stamps and come join us in the gallery. This is my card and I hope you get inspired to come and play along. This image was bought on Ebay but there was no information at all about it from the seller, but I love this sweet Fairy and the rest of the stamps on this set, there are a lot of small butterflies, some flourishes and flowers. I stamped it on a Ninah Solar White panel with Versafine black ink and clear heat emboss it, then I sponged the paper with Distress Inks, the corners were punched with a "My Paper Studio" punch. The little charm says "believe", I hope you can see the word. The sentiment is from a retired Flourishes set called "Orchids". 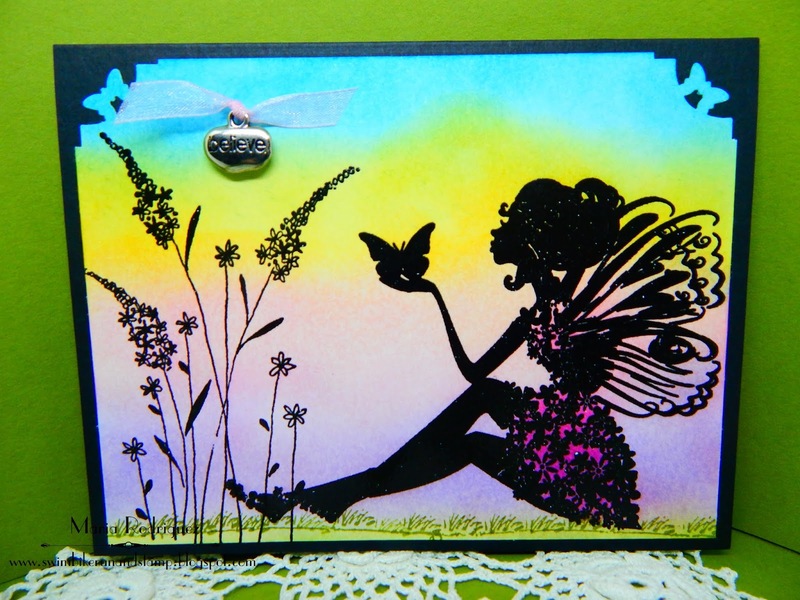 So I hope this card inspires you to play along with us at SHOPPING OUR STASH, we can't wait to see what you create.